Satliva Hemp with Argan and Activated Charcoal Shampoo Bar is here to revamp your hair. Lemongrass oil is beneficial in strengthening hair follicles and bringing relief to other scalp conditions. 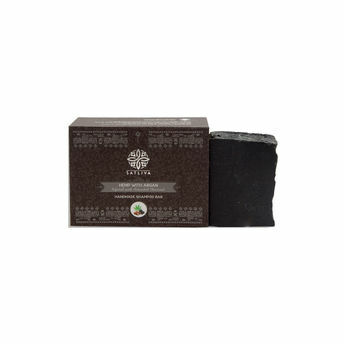 Activated charcoal cleans, removes impurities and absorbs excess oils without stripping hair of natural oils. Argan oil is also amazing at getting rid of knots! Yes, this is a 2-in-1 shampoo and conditioner in a bar. It not only washes your hair but has conditioning ingredients as well. You need to give the shampoo bars some time to rid your hair of the old residues from your commercial shampoo. As shampoo bar soaps do not strip hair in the same way as detergent based shampoos, you may notice that wet hair feels different after washing than what you may be accustomed to. This is perfectly normal; you'll love how your hair feels after it dries.